The State of Oregon, shown in red on the adjacent map, is bounded by Washington on the north, by California on the south, and by Idaho on the east. Oregon is bordered by the Pacific Ocean to its west, and by Nevada to its southeast. Oregon is the 10th largest state in the United States, covering a land area of 95,997 square miles (248,632 square kilometers). The state is divided into 36 counties; some of them, such as Tillamook and Umatilla, are named for indigenous tribes. This Oregon map site features road maps, topographical maps, and relief maps of Oregon. The detailed, scrollable road map displays Oregon counties, cities, and towns as well as Interstate, U.S., and Oregon state highways. The pannable, scalable Oregon street map can be zoomed in to show local streets and detailed imagery. to view a scalable Oregon road map. The detailed Oregon map and the regional Oregon map display cities, roads, rivers, and lakes as well as terrain features. The detailed map shows only the State of Oregon, while the regional map shows Oregon and the surrounding region. Oregon's capital city is Salem. The major cities, Portland and Eugene, as well as the state capital, lie along the Willamette River valley. Other noted cities in Oregon include Beaverton, Corvallis, and Hillsboro. In 2005, the population of Oregon was estimated at 3,638,871, which is about 37.9 people per square mile. In 2010, Oregon's population rose to 3,831,074 people. The state's Interstate Highways include I-5 and I-84, plus a short stretch of I-82. The name Oregon was first used by Jonathan Carver in 1778, and may have been taken from the writings of English army Major Robert Rogers. Near the Pacific coast lie the densely forested slopes of the Coast Range, followed to the east by the fertile Willamette Valley and the Cascade Range. The Columbia River borders Oregon on the north, while the Columbia Plateau stretches east towards neighboring Idaho. Tourists enjoy Crater Lake National Park and the John Day Fossil Beds, while the more culturally-minded appreciate the Oregon Shakespeare Festival. For Oregon travel and tourism information, visit the official Oregon tourism site and Oregon Atlas. This Oregon reference map shows major cities, roads, railroads, and physical features in Oregon. 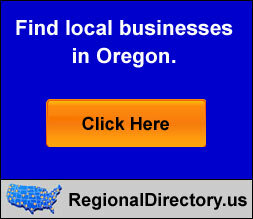 Several map publishing companies offer printed maps of Oregon. For example, Omni Resources offers several maps of Oregon that feature points of interest, airports, and parks, as well as selected local attractions and insets of major Oregon cities. Oregon-Map.org Editor, State Maps, PO Box 775, Barnegat, NJ 08005.